Fresh applesauce made, processed and canned for winter. Thanks to Robin, I was able to quickly whip up a batch and got it stored. I will make at least a couple dozen more for us to have and for those daycare lunches. Farmer's Market corn husked, cut, processed and canned for a great Shepard's Pie on a wintery day. Way too many (for someone who doesn't like tomatoes) pints of crushed tomatoes ready to go for sauces, Minestrone soup and lasagnas. I may not like them but there is nothing better than homemade sauce and real tomatoes in dishes that you know are not filled with preservatives. Excellent! 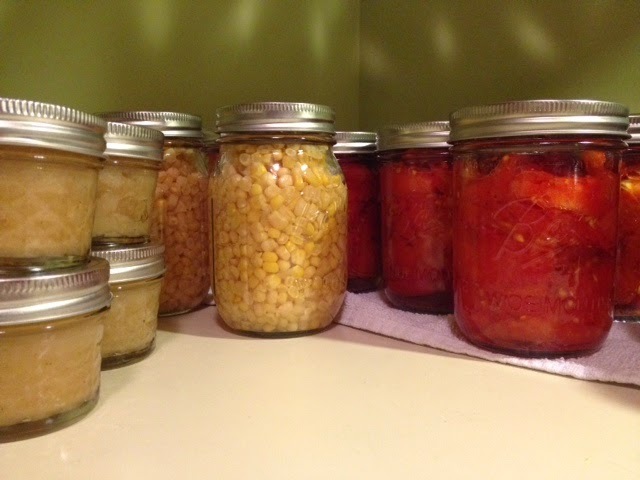 There's nothing like home canned food in the winter. Shepherd's Pie sounds really good.